The Flagstaff Hill Golf Club is proud to offer a diverse range of membership categories aimed to suit the time and availability of most keen golfers. From Full 7 day membership, through to social, lifestyle or 9 hole only categories, there are plenty of options to choose from. There are many benefits of becoming a member of the Flagstaff Hill Golf Club. Being a member of the club is much more than the freedom to play golf whenever you like within the times for your membership type. It brings great friendships and a social life, and becomes a lifestyle. 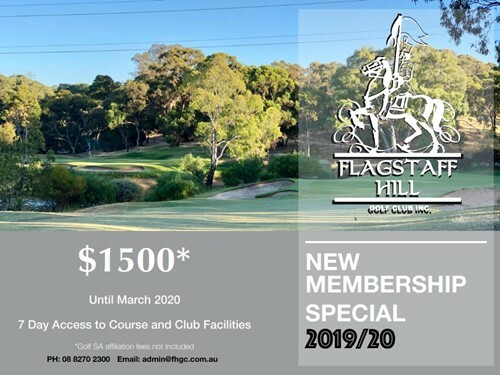 Flagstaff Hill members enjoy a discount when using credit on their member card in the Restaurant, Bar or Pro Shop as any credit added by the member has a bonus of 5% for every $100 added. For Platinum members this is 10%. Flagstaff Hill Platinum, Gold and Silver members have access to five other golf clubs through the Club Advantage arrangement. Up to 3 games a year can be played at Blackwood, The Vines of Reynella, Mt Osmond, Tea Tree Gully and Westlakes golf clubs, with equivalent playing rights to their Flagstaff Hill membership. The membership financial year runs from 1st April to 31st March with pro-rated subscriptions available for those members choosing to join part way through the year. Download an Application Form. Call the office on (08) 8270 2300 Option 2 for enquiries. This is our Premium membership with Full 7 day access. With priority access to the online booking system and NEW permanent Saturday booking sheet with automatic pre-booking available. Seven day Club Advantage Card. Limited to 250 - waiting list applies. Special tiered pricing for under 25s & under 30 - see below. Silver Membership is our limited 6 day Membership. 7 Day membership for the Under 30’s and Under 25's. 18 hole membership for Juniors 10-18. Great way to experience club golf! Designed specifically to suit todays hectic lifestyle. Great way to get together and play casual golf with your friends or colleagues.